Lawyers don't leave the outcomes of high-profile and high-stakes jury trials to gut instinct and chance. They rely on jury consultants who are human behavior experts, helping attorneys research and select jurors and provide insight into juror behavior. Jury consultants are used in both criminal trials and in complex civil litigation. 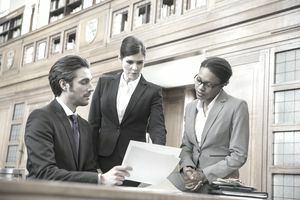 Jury consultants possess a minimum of a bachelor’s degree, but a master’s degree or Ph.D. in behavioral science, sociology, political science, criminology, psychology or another social science is usually preferred. An additional degree in law is helpful but not mandatory. Jury consultants are hired for their intuition and their knowledge of human behavior, not their legal expertise. Jury consultants are integral to the legal process even before a trial begins. They research the jurors' backgrounds, create juror profiles and assist with jury selection and voir dire — the questioning of prospective jurors. Jury consultants may conduct focus groups and mock trials. They also conduct pretrial research, gather and analyze demographic data, perform statistical analyses and draft analytic reports. Developing trial strategies to help shape juror perceptions is one of the most important responsibilities of a jury consultant because it can lead to a favorable outcome. The consultant will provide insight into jurors' body language and behavior at trial, as well as coach witnesses for the best possible presentation of facts under questioning. He may help lawyers identify arguments and develop strategies. Some jury consultants create courtroom graphics and multi-media presentations to help the attorney weave a compelling and persuasive story for the jury. Although a law degree isn't required, a jury consultant should at least possess a firm understanding of legal procedures and terminology. Client development skills are also helpful in acquiring a strong and lucrative client base. A typical mock jury trial can cost upward of $60,000. A sophisticated electronic presentation might cost $125,000. These hefty fees translate into generous incomes for jury consultants. While salaries begin at around $44,000 as of 2016, they can top $100,000 and experienced consultants with Ph.D.s may earn considerably more. Most jury consultants are often employed by consulting firms that can range in size from small boutique firms to large, international companies, but some work on their own. Some large law firms employ in-house jury consultants. The nature of the work is fast-paced and demanding, and it can require extensive travel and challenging schedules to meet client deadlines. Where there are high-stakes, big-money cases, there's work for jury consultants. This career has grown in popularity due to highly publicized trials like those of Casey Anthony and Jodi Arias.